I have no idea how many times I have taken a group of kids up to Dahlonega in north GA to go Gold mining. I have also ordered ‘gold dirt’ and taught this lesson to Pioneer Girls and other youth groups. It can be adapted to any mining near you with a little imagination (ruby, sapphire, even shelling at the beach). However, this can also be taught with sands and rocks *. God has provided so many lessons and insight into Himself all around us. I would urge you if you ever have the chance, to go to a gold mining attraction and take the kids. There is so much to teach them about God in their life through the experience. God is the gold miner and the pan is Jesus. The dirt is the world we are living in as sinners and the water is the Holy Spirit at work in our life. The gold miner (God) uses his pan (Jesus) to separate the gold (us) from the dirt through the power of the water (the Holy Spirit). The power of the water is just strong enough to not wash out the gold with the dirt. The pan has grooves scored in its side to make it possible for the gold to stay with the miner and not be washed away with the dirt, just like Jesus was scored with whips and scarred through nails and thorns and ultimate death that we might have a way to God. The gold has been found, but now the miner (God) begins to prepare the gold. At this point they just listen, their part is done. The Holy Spirit works in our lives to bring us unto Jesus that we might be prepared by God to glorify Him. 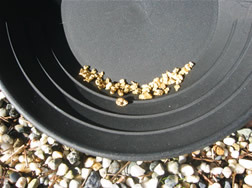 Once the Gold is separated out from the dirt by the pan and the water the gold miner starts the next process. He submits the gold to fire to purify it from all the traces left by the dirt of the world; the hotter the fire, the purer the gold. The gold miner knows when the gold is finished and totally pure when he can see his reflection in the gold. God continues to work in our life so that He might see Himself in us. We are totally purified when we reflect Him. When the miner (God) sees Himself in the gold, it is purified. This is such simple truths that can be taught any age by adjusting the story. Even if you are simply walking a shore looking for shells, you can teach the child the real treasures are buried and need to be washed to be seen and teach as little or as much as they can retain. ARM your child.